If you are serving full time in the SCDF (police force and fire department), all hospitals and clinics, you are the HEROES in our eyes! 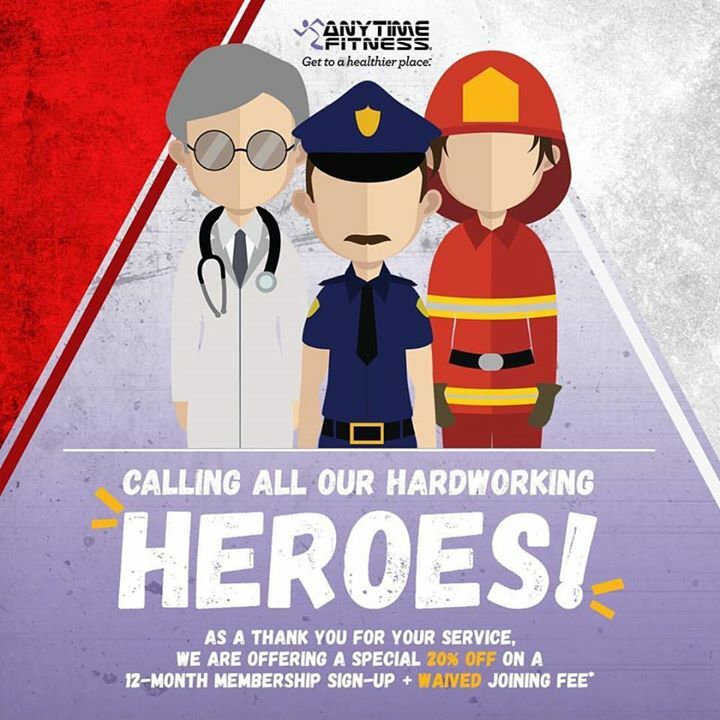 Anytime Fitness @nex is honored to acknowledge your courage and sacrifice, and gratefully invite you to join us, so we can journey with you To A Healthier Place. We know you pull in the long hours and the odd shifts to keep our country safe and tend to all emergencies. Our Club will be a perfect workout place to suit your hours, as we never close! Call us now at 81682653 | 65553400 or visit our Club @nex, Rooftop Garden Level 4R, to know more about this special offer just for you, our HERO! Previous: [Claude Bernard] Time is free, but it’s priceless. Next: [POMO] Calling All Students!